This type of glove was meant to work in all kinds of work environments. It is the best type of glove to use if you are a chemist. You might want to wear another type of glove underneath it though if you are dealing with extreme chemicals. 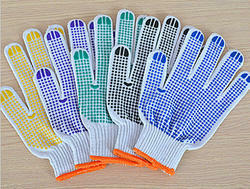 The reason for that, is because of the cotton nature of this type of glove. Most of them are made from pure cotton and have just as much liquid leakage as regular cotton gloves. The PVC dots keep this more minimal than full cotton gloves, but they are still very intolerant of liquids. The reason why these gloves work so well for chemists is because of their gripping nature. Chemists need to have a full grip on their bottles and experiments. Most of these experiments deal with glass bottles and vials. If you have any other type of glove, it will slip from your hand. Looking for pvc dotted gloves ?